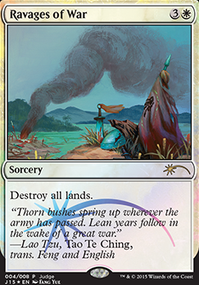 can i use burning wish to bring things into EDH that are banned in EDH? for instance, Emrakul, the Aeons Torn ? mono red edh BLUE CARD COMBO!!! 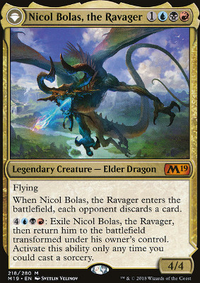 Looking at your commander I immediately want to do something with the new Guilds of Ravnica cards that count instant and sorceries in exile. 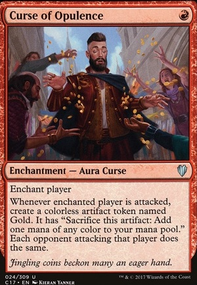 In the actually helpful range, it sounds like you're doing some tournament play, which usually means you get a sideboard if you want one. Have you thought about Burning Wish , Cunning Wish etc. To give you some more space to play with? Flooremoji on Burning Wish, Ramp. 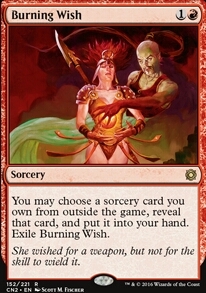 The numbers look fine, but what cards does Burning Wish find? Just to clarify, wishes are not against the rules. They are against the rules without prior agreement about their scope. So I ensure that I discuss things prior to playing, and I have a pre-build scope for the Burning Wish , specifically a small list of cards that I can pull from, my sideboard list. It has been satisfactory for all my opponents at this point. 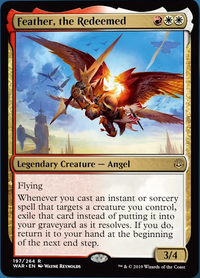 SirOmega at some point in the past comments or in the primer I covered that Burning Wish is a meta choice. No one has ever objected me playing it when I just show my wishboard ahead of time, and tell them I am only going to wish from that very short list. Not a single time has anyone objected, not in any random game store, not at any random friends house, no place or player has ever objected when I allow them to look at my wishboard before the game. So I ALWAYS get prior agreement, before every game. In essence, this makes them within the rules. I establish their scope to just the wishboard. Half the time, I think people are a little relieved that the cards in my wishboard are not in my deck, and must be wished for. If someone did object to me playing that card, I would just pick one of the wishboard targets, or possibly another tutor. Either one would be fine. I've been testing a wishboard in my own Zada list with Burning Wish as a way to grab things I wouldn't want in the main deck, a la answer cards such as Blasphemous Act and Vandalblast. It gives a lot of flexibility to the deck, especially if you run cantrips in the wishboard as well to turn the wish into another enabler if need be. i love this deck, very competitive way to use shahrazad/subgames, especially with squeezing mill in, too. But remember with Burning Wish; if you target and remove a Shahrazad that's resolving from a previous game, your subgame(s) stop trying to resolve and end immediately. i'd guess it'd be considered a draw if the subgame ended that way..? 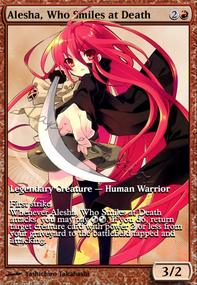 Quick update with some evolution of the deck, even though I need to update my decklist. I went to a LGS that I had never been to today. Was in a 4 player pod and over two games I faced Sidisi BUG Dredge Zombies, Food Chain Prossh, the same Jhoira Paradox Storm, the same Kambal Combo Control, and a janky Azusa Lanndfall deck. I had made a few changes before going, knowing that I would face storm combo and likely other combo in a competitive environment. I won both games I played. It took some serious threat assessment, some serious surgical excision of specific threats, and some changes in my deck list to log both wins. Exiling Aetherflux Reservoir on turn two from Jhoira's deck with Hide // Seek because Jhoira already had Paradox Engine in hand. She subsequently cast it as soon as possible on turn 3 to avoid my other ways to dismantle her deck. She would have stormed off the next turn, but I Anguished Unmaking'd it. Jhoira was hamstrung for the moment. I beat Sidisi shortly after this with a Merit Lage token created with a Vesuva. Bring the Aggro when you can. Kambal was taken down when I Backlash'd his 68/68 Serra Avatar. Turn their strengths against them. I dropped a Rule of Law that basically killed the game plan of both Prossh and Jhoira, delaying the game as I assembled an unbreakable fortress. Prossh's face when I Burning Wish'd for Slaughter Games and exiled the Food Chain from his hand before he could assemble a winning combo. Prossh's comment about my deck playing so many silver bullets against their decks. 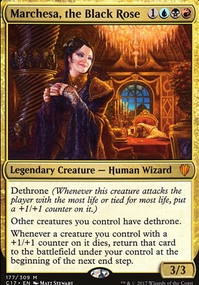 Riding an unblockable Master of Cruelties to beatdowns of both Prossh and Jhoira, despite both going off and going through most of their decks before they fizzled without finding an answer. Both Prossh's and Jhoira's faces when I offered to draw with the super janky Azusa deck who had played about 30 lands and not much else that game. Azusa took the draw, leaving both the combo players feeling totally ripped off. Golden. 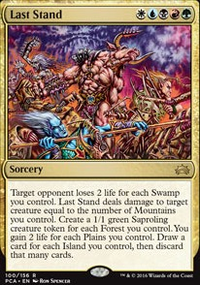 I will update the decklist with some changes, but suffice it to say that I swung slightly stax against combo. Seemed to work pretty well.